Hey everyone and welcome to the Fancy Friday Blog Hop! I’m so happy to be joining this fantastic group for the first time! If you’re new the the Fancy Friday Blog Hops, we are a group of past and current Artisans that get together each month on the last Friday of each month to bring you Crafty inspiration with monthly themes and challenges. I’m so honored and excited to be a part of this talented group! Now onto this month’s focus! This month we are Challenging ourselves to choose one of the many lovely bundles from the Annual Catalog. I chose the adorable Little Elephant Bundle. 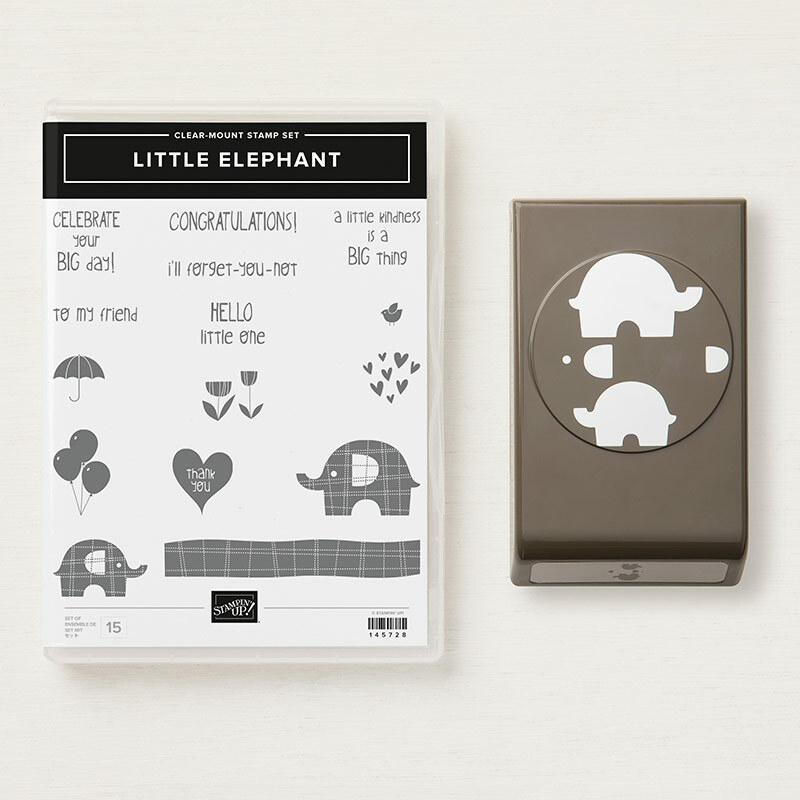 This bundle is so sweet, with the cutest sentiments, fun patterns, and little elephant images that coordinate perfectly with the Elephant Builder Punch. It's definitely a must-have. 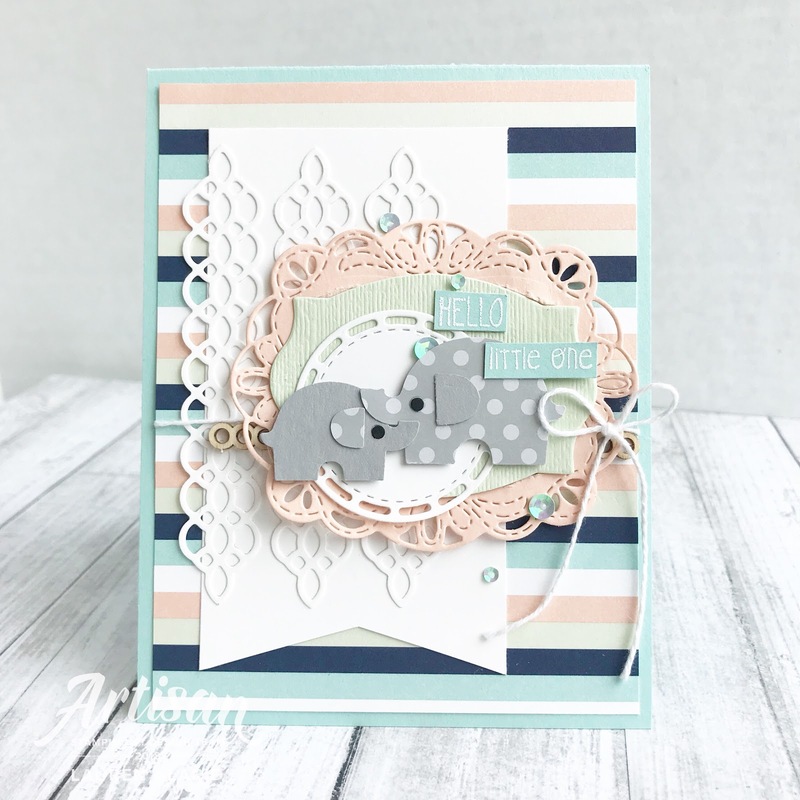 For my card, I wanted to really emphasize those cute little elephants, but wanted them to have a different pattern than the one in this stamp set. 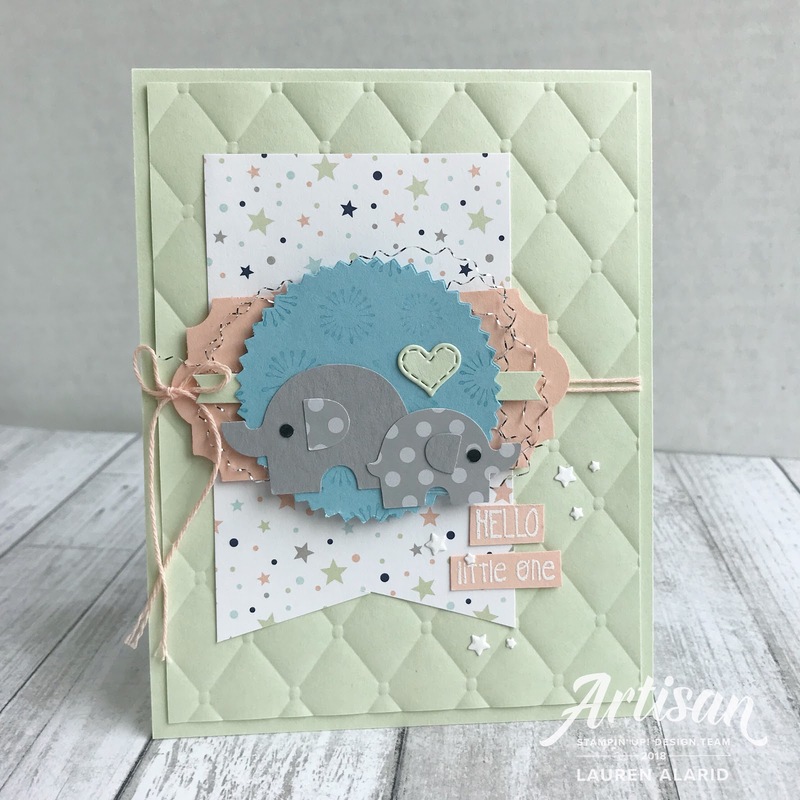 I used the punch to punch out the large and small elephant from both the Smokey Slate polka dot patterned paper in the Neutrals Designer Series Paper (DSP) as well as from Smokey Slate Cardstock. I layered them onto a few label elements for my main centerpiece. For my background elements, I use a layer of Twinkle Twinkle DSP. Then I wanted to add a little texture. I used one of the long flourish-y die from the Petals & More Thinlits Dies Set to cut from Whisper White Cardstock 3 times and adhered it on top of the Twinkle DSP. Then I added my White Baker's Twine and main focal piece. I stamped my sentiment and finished off my card with a few sequins from the Iridescent Sequin Assortment. 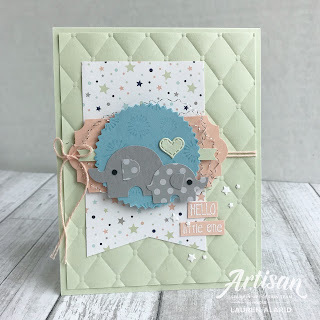 Here's one more card I made with the extra elephant punch pieces. They're just too cute not to create with! I hope You have enjoyed my card for today and don't forget to keep hopping for more inspiration. Up next on the hop is the incredibly talented Rochelle Blok. Hey peaches! I feel like it's been way too long since my last watercolor card and I have been having some serious withdrawals, LOL. 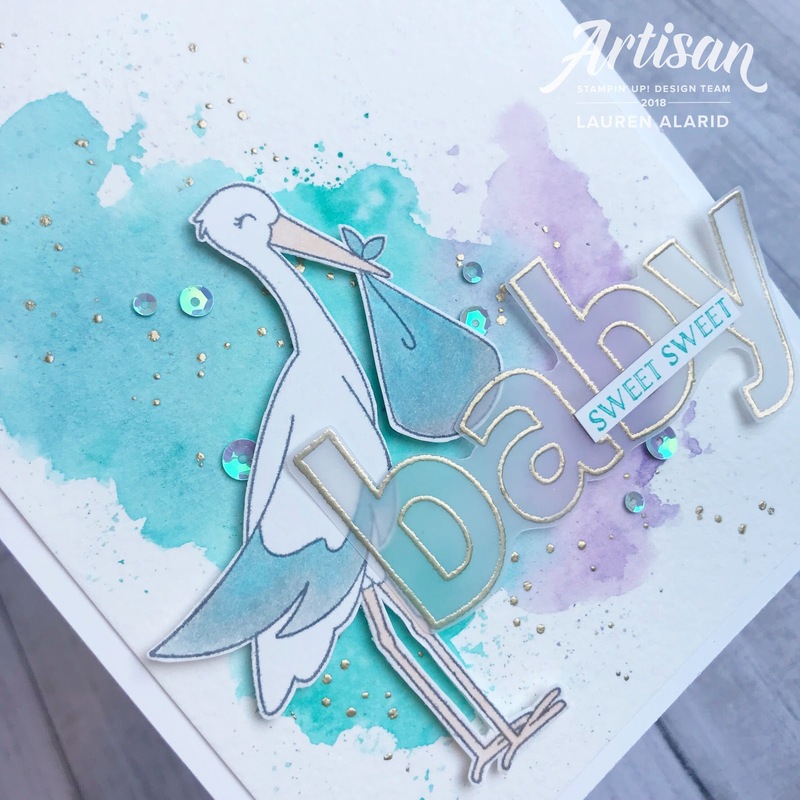 So here is a really whimsical baby card featuring the Precious Delivery Stamp Set. I am so seriously in love with this set. 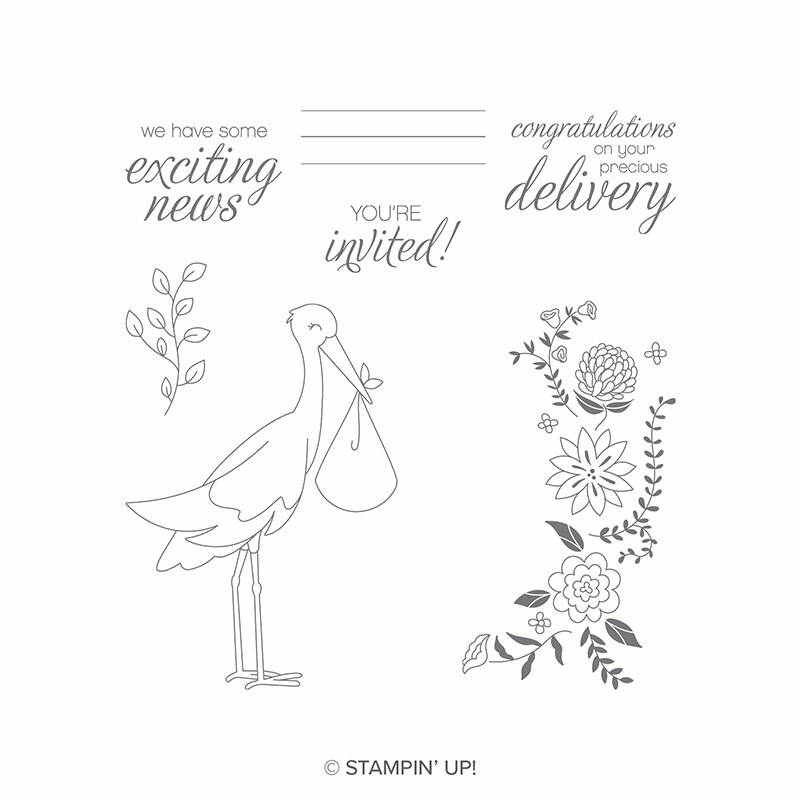 That elegant stork, beautiful script-y font, and I love that they included a few stamps designed to create invites. I really don't have many of those and I think this set could work so well for baby showers or any party, really. It's surprisingly very versatile. For today's card, I started with a piece of Watercolor Paper and my Aqua Painter and created a watercolor wash background. The colors that I used were Highland Heather Ink, Bermuda Bay Ink, and Balmy Blue Ink, making sure to blend where two different colors meet. To create the sentiment I used the Lined Alphabet Set to stamp out the word "baby" in Versamark Ink and heat embossed it in Gold Embossing Powder onto Vellum Cardstock. 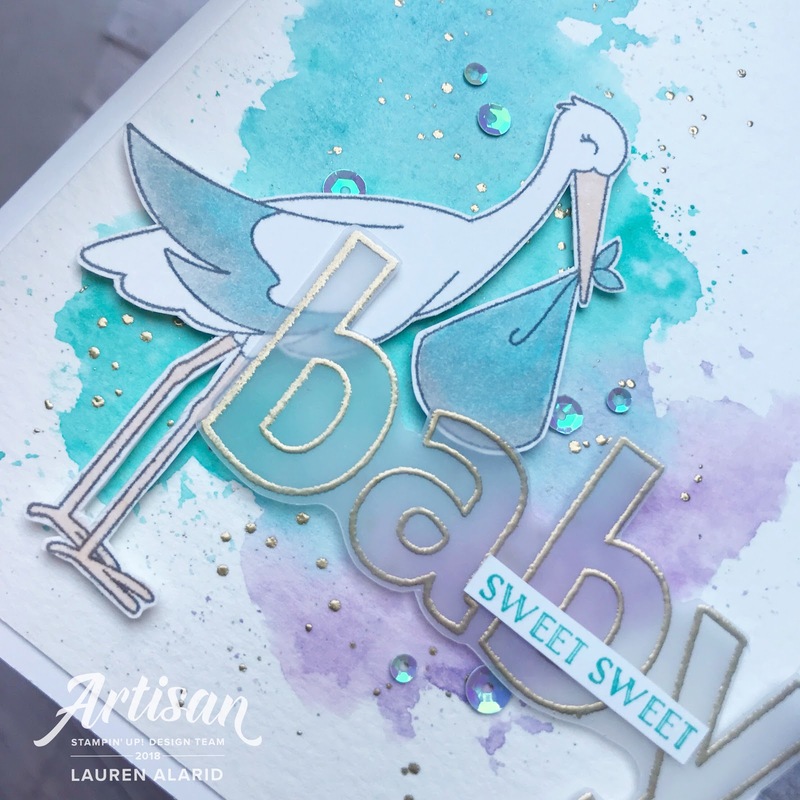 The "sweet sweet" sentiment comes from the Itty Bitty Greeting Stamp Set. I finished it off by adding (you guessed it) a few sequins from the Iridescent Sequin Assortment. Well, that's my card for today! Thanks so much for stopping by and I'll see you next post! Well, hello, peaches! It's been quite the weekend! There were birthdays and bridal showers and all manner of celebrations. So now it's nice to get back to my regularly scheduled week. Don't get me wrong; I DO love a good party, celebrating with friends and family, but after that busy, celebratory weekend, I'm happy for some quite and slower paced activities and you KNOW that includes crafting. For now, though, I'll share the birthday card that I made for my 7-year old's birthday (I still can't believe she's seven). Today's card features a little of this and a little of that. I started by creating the background. 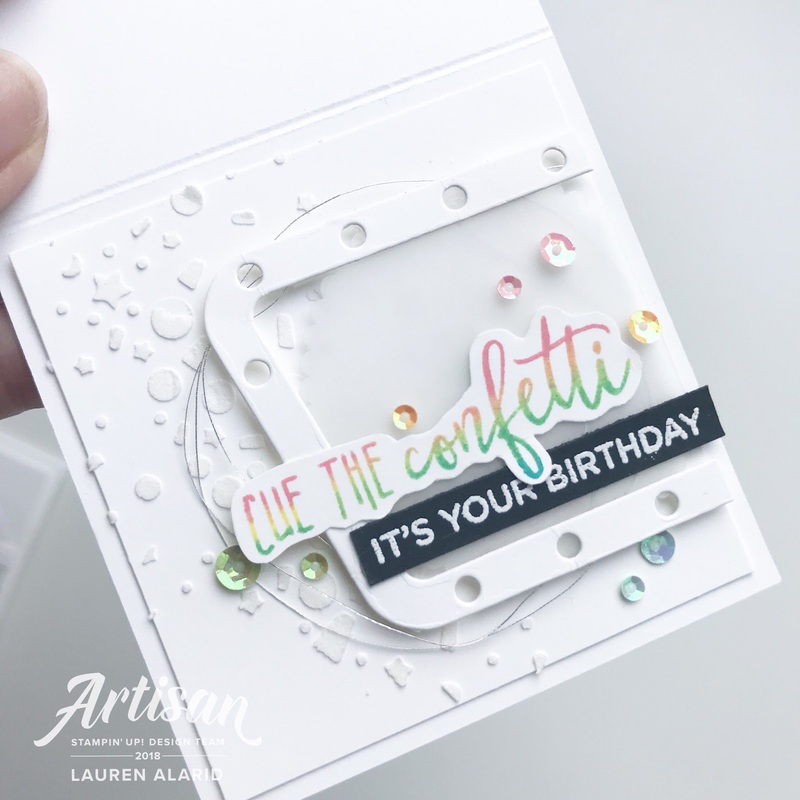 I wanted it to look like a party on a card, so naturally there needed to be confetti. I used the largest confetti die in the I used the Candles & Confetti Framelits Dies to die cut from some scratch paper to create a mask. I used the mask to add a fun textured confetti background by spreading Embossing Paste over the mask, onto my background. I didn't add any color to the paste because I wanted it to be a subtle textured background. 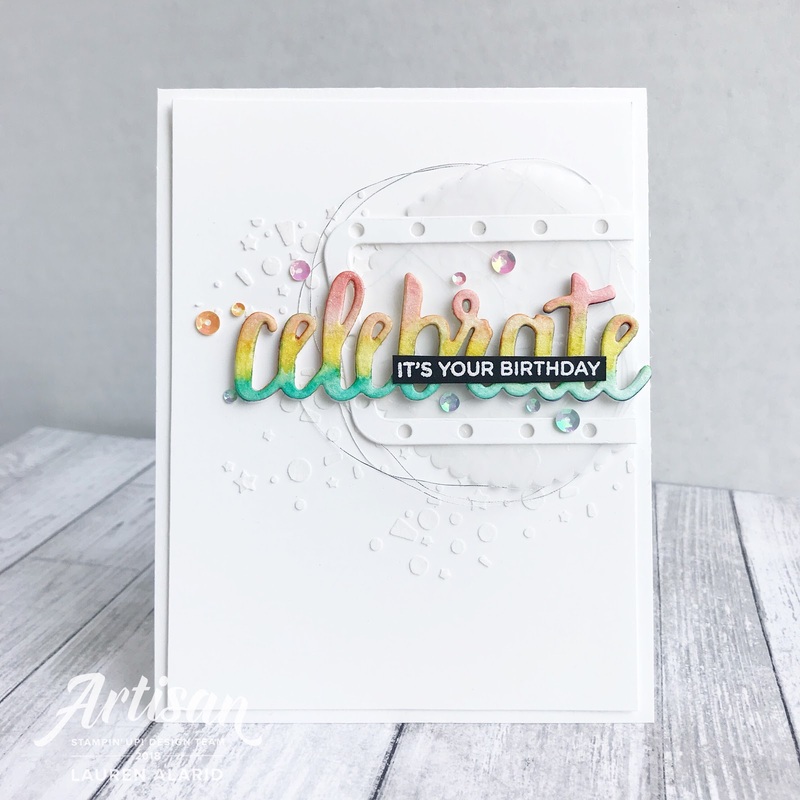 Use Flirty Flamingo Ink on the top portion of the word celebrate. Next, use Pineapple Punch Ink for the middle section of the word, making sure to blend where the Flamingo and Pineapple meet. Finally, use Bermuda Bay Ink for the bottom portion of the word, making sure to blend where the Bermuda and Pineapple meet. 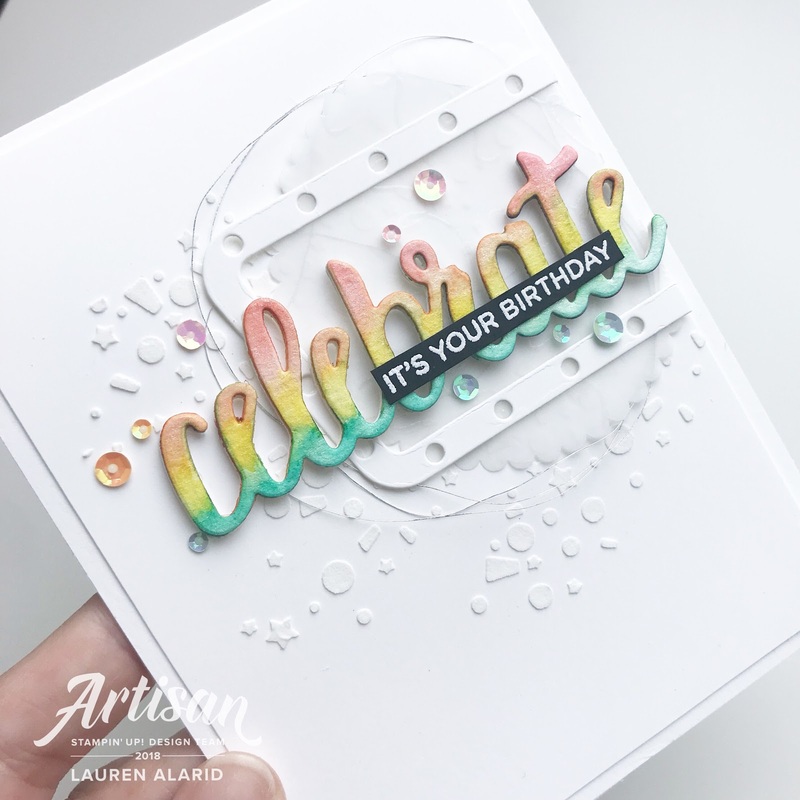 When the colors meet in the middle, they mix and create this beautiful rainbow word sentiment, which adds some colorful "pop" to this card. 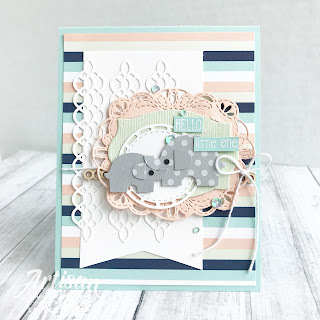 This card is packed with all kinds of fun details! 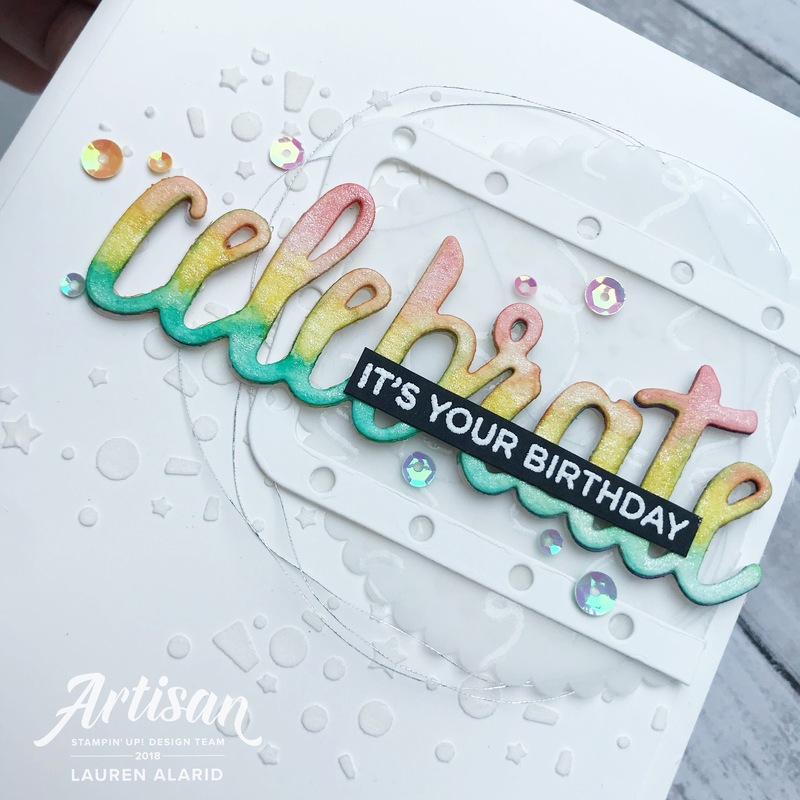 If you look closely at the picture below you can see the embossed party streamers on the Vellum Paper Scalloped Circle Die Cut. 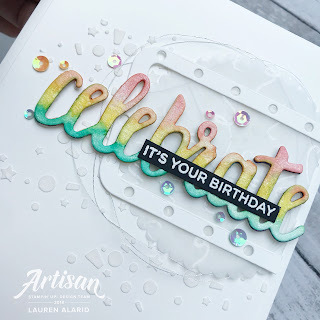 I used the Birthday Backgrounds Set and some Clear Embossing Powder to create this effect. To finish off my card, I used the Broadway Birthday Stamp Set for the tiny sentiment, added some Silver Metallic Thread, and a few sequins from the Iridescent Sequin Assortment. Here's the mini 3 x 3 lunchbox version I made for my daughter's lunch for school. Thanks so much for stopping by and I'll see you next post!